This one bedroom / studio condo has all of the amenities you want any time of the year. 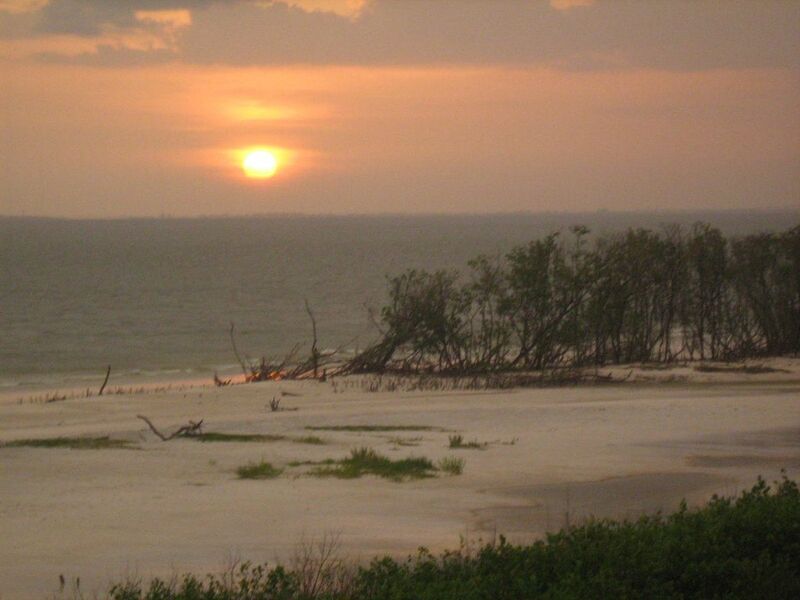 You will enjoy a gulf/sunset view and a view of downtown Fort Myers Beach and Sanibel Island. In addition, it overlooks an estuary, where exotic birds feed throughout the day. What's more, to enhance your vacation convenience, it is fully equipped, including free Wi-Fi right in the unit. These all combine to give this condo a truly exotic and tropical feel. You may see as many as 15 species of birds, including the beautiful pink Roseate Spoonbill, right from the balcony. It is a bird lovers' paradise and a nature lovers'delight. This studio apartment is light, bright, colorful and refreshing. There is a king-size bed in the bedroom, and a queen-size sleeper sofa in the living room. It has a fully equipped kitchen, and is completely tiled throughout. Located on the ten beautiful and private acres of the Estero Beach and Tennis Club complex, the amenities include a heated swimming pool, four Har-Tru tennis courts, and an outside barbeque. Washers and dryers,(coin operated), are located in each of the three buildings. The complex is located directly across the street from Santini Marina Plaza which boasts a number of stores, restaurants, a deli, a marina, a bank, a bookstore, a drug store, hardware store, and a stationery store with a U.S. Post Office outlet. A public golf course is located down the street, and a trolley which runs the length of the island, stops directly in front of the complex. The fare is 25 cents. You will enjoy not having to use your car for everything. OFF SEASON SPECIAL: May - Oct., rental fee is half off the in-season price. There is also great flexibility during this time of year with regard to check-in and check-out times as well as length of stay. Chris and Steve, who reside in Long Island, NY, are used to beaches and spectacular water views. That is why they fell in love with Southwest Florida and especially Ft. Myers Beach. After renting for many years at EBTC, they decided to buy their unit because of their strong affinity for the beauty of the area and the ambience of the complex. The unobstructed beach and water views from this unit give it the cozy, private feel of a 'cottage'. Add to that all of the amenities of a fully equipped condo, makes this an ideal vacation location. You can see the beach from every window and room in the unit. The calm blue waters of the Gulf of Mexico are steps away from the door. Beach toys, puzzles, games, etc. answering machine, new air conditioning, new VCR/CD/DVD player, fully equipped kitchen, including all utensils, coffee maker, toaster, bed linens, towels, beach chairs, beach towels, coolers, Complex has heated pool, 4 Har-Tru tennis courts, outside barbeques, all located on 10 beautiful acres. Boat rentals: Power Boat,Canoe,Pontoon. Bicycle and Scooter rentals; Casino Boat; one day boat trip to Key West. Close to the Edison Museum, Sanibel and Captiva Islands, and the Tanger Outlet Mall. Ft, Myers is where the Boston Red Sox and Minnesota Twins hold their annual spring training.